The story of the century keeps getting wilder. Stop everything you’re doing—the Fortnite cube is doing more stuff. The adventurous purple box has now left a new gravitational field slightly southeast of Retail Row. It’s the fourth gravitational field that has been left by the cube in its travels around the map since it started its journey on Aug. 28. 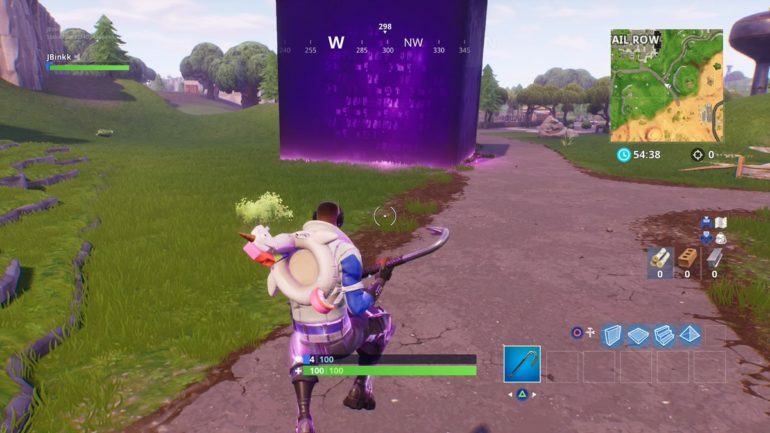 Once again, the cube has left its mark in an area predicted by Redditors who lowered their game’s quality on mobile to find spots where the cube had been and would be soon enough. The other gravitational fields were left in the cube’s wake near Greasy Grove, Salty Springs, and Fatal Fields. The next predictions say that the cube should now travel north and leave a field between Wailing Woods and Tomato Town. After which it will begin moving west again. Whatever the cube is teasing and building towards should be revealed in the next few weeks. Fortnite’s fifth season should be coming to an end some time after the 10th week of the campaign, which begins next Thursday, Sept. 13. Season six should begin the week after or possibly sooner.